Walcha is a small town located on the Oxley Highway between Tamworth and Port Macquarie, in the New England Tablelands. It was once described as one of Australia's most art-friendly towns by well known Australian art critic John McDonald, a title that's largely due to the Open Air Gallery that can be found here. There are over forty sculptures included in the gallery and most of them are incorporated into the town's Sculpture Walk. The route conveniently begins at the Visitor Information Centre, where you can collect your map and a brochure (if you're running low on time, ask for the main ones to be highlighted for you). I was determined to find every sculpture in the area and the first ones I got to see were those in McHattan Park, across the road from the Information Centre. These are examples of some of the larger sculptures on the route and one of them, 'Weather Signs', actually inspired the walk. 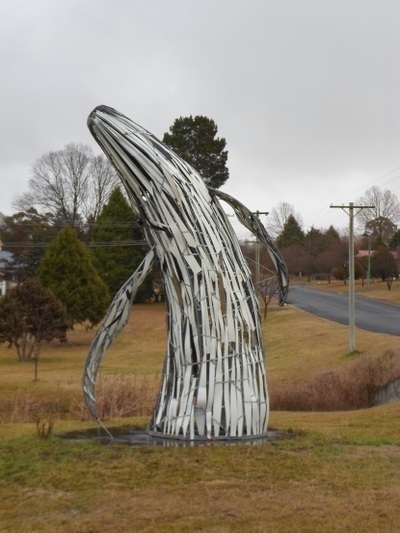 This piece came about after local resident Stephen King approached Walcha Art Council with an offer to create a fountain sculpture for the park. The council took him up on the offer and ended up deciding to facilitate an ongoing arts program, which was adopted by Walcha Council in 1998 and has now become the Open Air Gallery. From McHattan Park, the route heads down the Fitzroy Street, where the works are a little less impressive and are largely a mix of sculptural benches, mosaics and carved wooden posts.Yet while the pieces aren't as grand as some of the others you'll see, there is quite a concentration of works along this stretch. 'Song Cycle', on the roundabout of Fitzroy and Derby Streets, is one sculpture that should not be missed. 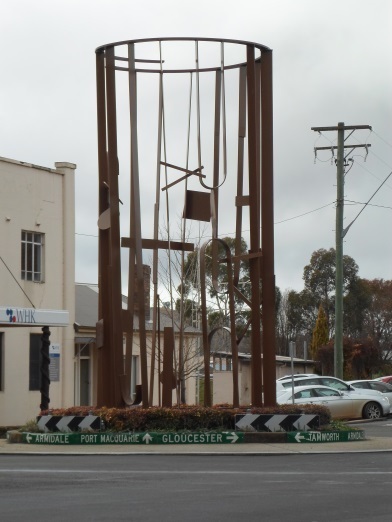 It's one of the most prominent on the route (being the only one I noticed on my way to the Information Centre) and was commissioned by Walcha Arts Council after a roundabout sculpture competition. All four maquettes created for the competition are incorporated into the walk. The rest of the sculpture walk includes a sojourn over Apsley River and a stretch along the water's edge. The latter stage features some of the grandest sculptures, as well as the best scenery. 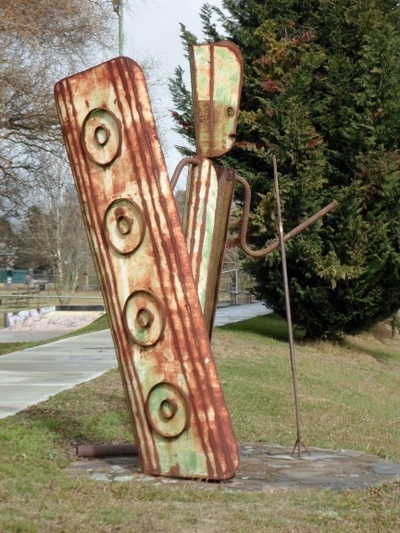 Once you've finished the walk around the heart of town, there are still a few sculptures that you can check out by car, usually located at key sites around the area like the local school and preschool. 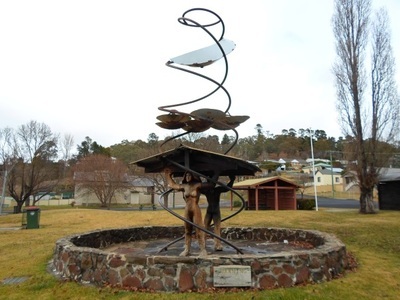 There's also sculptures located at each of the four entrances into Walcha. Despite my efforts, I struggled to find some of the sculptures. Twice I found that they hadn't actually been placed outside in the 'open air'; 'Life on First Breath' was actually located in the foyer of Wacha Community Health Centre, while 'Sea Monster' was in the conference room at Walcha Council Chambers. In the other cases, perhaps the map needs to be updated, or clarified. The walk seems to be continually evolving anyway. When I completed it, a large whale sculpture had just been added along Apsley River, which wasn't yet marked on the map. Apart from the Open Air Gallery, there isn't much in town to draw you to Walcha. When asking for advice at the Visitor Information Centre for other sights we might incorporate into our tour, my companion and I received no suggestions, though we did discover Walcha Pioneer Cottage and Museum on our own, which I would have liked to explore had it not been closed. There are other attractions worth checking out in the surrounding area however. Apsley and Tia Falls, two of the many waterfalls in this part of New South Wales, are located to the east, while the town is also part of Thunderbolt Way, a tourist drive between Port Stephens (NSW) and Goondiwindi (QLD). This route covers the area where bushranger Captain Thunderbolt (Fred Ward) roamed for more than six years eluding police, and includes attractions like his grave and some of his hide-outs. 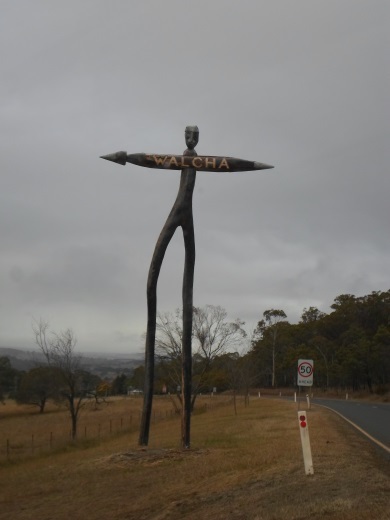 Walcha also has its own resident of interest--Nat Buchanon--who was a pioneer bushman, drover and explorer responsible for settling large amounts of the area in this district. His grave can can be found to the north of Walcha.